California native Tony Gemignani has a passion for pizza. The chef and restaurateur owns seven pizzerias across the country, including his flagship Tony’s Pizza Napoletana in San Francisco and Pizza Rock in Sacramento and Las Vegas. In addition to receiving numerous accolades, honors, and awards, Tony is also one of only three people worldwide to be named the official US ambassador of Neapolitan pizza by the city of Naples. 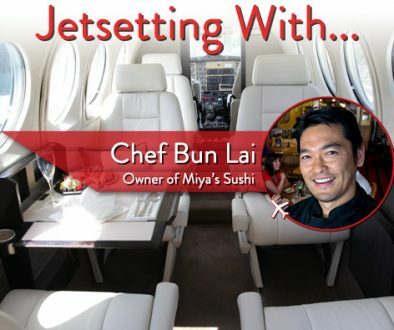 So, where does a pizza-loving chef love to travel? We asked, and Tony answered! A: I’m a spa aficionado by day and a partier by night. Q: What types of activities do you like to do on your travels? A: When I travel, I spend my time eating and drinking as well as relaxing at the spa with a massage. Q: Do you look for a place where it’s quiet and you can relax or someplace that has great activities or nightlife? A: Both. I enjoy relaxation time in the spa, followed by nightlife activities. Q: When thinking about where you will travel to next, what inspires you to make a decision? And what, if any, research do you do about that destination? A: Most of the time I travel for work, but if it’s for pleasure I look for warm destinations, preferably by the beach where there are some nightlife activities and a nice hotel. Or, even better, I look for a nice hotel with a spa. Q: What is the most memorable trip you’ve taken and why? A: My honeymoon to Italy in 2000. It was the year of Jubilee and Italy looked more beautiful than ever. We started in Milan, then Venice and worked our way down to Cinque Terra, Viareggio, Lucca, Pisa, Florence, Rome, Naples, Sorrento, and Capri. It was amazing—the food, wine, scenery, people, art, and architecture. Q: What is the best food you’ve ever found on a trip? A: Last year, my wife and I traveled to Italy. We started in Parma and had my favorite Prosciutto Di Parma and three-year old Parmigiano Reggiano and drank Lambrusco. The next day, we headed to the Chianti region and spent a day sipping Chianti Classico and touring the Ruffino and Cecchi Wineries. That night, we decided to drive somewhere, got lost in the middle of nowhere going though some rough terrain, and stumbled on a tiny village with an amazing restaurant. We had the best Florentine steak that continued cooking on a hot stone tableside with fine cheeses and more wine. The next day, we headed to San Gimignano and had gelato at a place that has won the Gelato World Championships for several years. It was out of this world. We then headed to Orvieto and finished our trip in Rome, where we had slices of pizza at Pizzarium by Gabrielle Bonci in the day and authentic pasta Romana carbonara for dinner. Q: What, if anything, do you always take with you when you travel? Q: What’s your best piece of travel advice? A: Always bring your important items and some clothing in your carry-on just in case your luggage gets lost. Forever. It’s happened to some friends of mine. Q: Is there a destination to which you can’t imagine not returning? A: Hawaii and Sorrento, Italy. A: I love weekend getaways to Napa, California. Q: Where would you like to travel to next? Q: Tell us about your upcoming project(s)? A: Man. A lot. I have two new restaurants opening in Las Vegas, including Pizza Rock at Green Valley Ranch and Little Tony’s at Palace Station, and we just opened Slice House in Green Valley Ranch as well. I’ll be on a book tour for my new book, “The Pizza Bible.” I’m launching a new flour line for professionals and consumers. I also have a couple of new projects coming to San Francisco and the Bay Area. 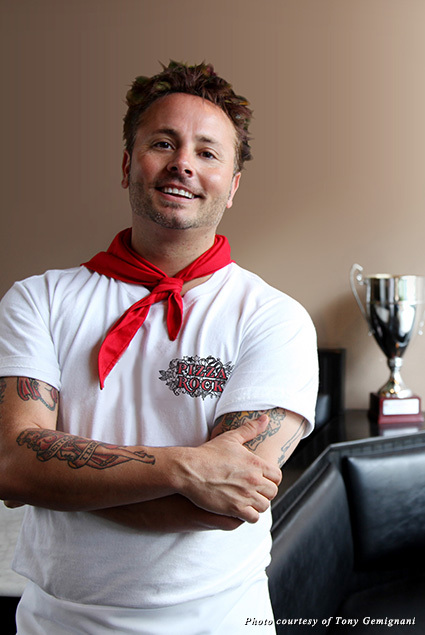 Tony Gemignani has had a passion for the pizza industry since 1991. His humble beginnings began at his brother’s acclaimed Pyzano’s Pizzeria in Castro Valley. He is president of the World Pizza Champions and is the only Triple Crown winner for baking at the International Pizza Championships in Lecce, Italy. In 2007, he won the title of World Champion Pizza Maker at the World Pizza Cup in Naples, Italy, where he was the first American and non-Neapolitan victor ever. He has also been named the official US ambassador of Neapolitan pizza by the city of Naples, a prestigious title only given to three people in the entire world. Tony received his Master credentials from the Scuola Italiani Pizzaioli and is the proprietor of the International School of Pizza, where he certifies aspiring pizza chefs from around the world. In 2011 and 2012, Tony won two world titles in cooking, making him an 11-time world champion. Since 2009, he has opened Tony’s Pizza Napoletana in San Francisco’s North Beach neighborhood, Tony’s Coal-Fired Pizza & Slice House (next door to his flagship location in San Francisco), Pizza Rock in Sacramento, and Capo’s, a Chicago-style Italian pizzeria and whiskey bar also in the North Beach neighborhood. Tony and his restaurants have received critical acclaim in the pages of USA Today, FORBES, SAVEUR, Men’s Health, and Food Arts, and he has appeared as a guest on shows such as “TODAY,” “Good Morning America,” “The Tonight Show with Jay Leno,” and “Rachael Ray.” Tony is a published author of his cookbook, “PIZZA,” and “Tony and the Pizza Champions,” a children’s book that tells the story of a pizza team’s journey to compete in the international Pizza Lovers competition. Tony has been inducted into the Guinness Book of World Records twice for creating the largest pizza and the most consecutive rolls across the shoulders, a unique pizza dough trick. Follow Tony on Facebook and Instagram.